Photographic Dynamic Range (PDR), like any dynamic range, is the difference between a high and a low measurement; highlight and shadow. In computing PDR I always use the Analog to Digital Converter (ADC) saturation as the high value. The low value comes from locating the appropriate point on the Photon Transfer Curve (PTC). The specifics are covered in a separate article. ISO settings are accomplished through gain, an amplification of the electrons that resulted from the signal. Gain versus ISO for a given camera is divided into up to three distinct regions. The region that is of most interest runs from the native ISO of the camera through the last ISO that is accomplished through analog gain. Some cameras have a region below native ISO that uses the native ISO analog gain and is accomplished through a shift in metering. Usually this corresponds to the �Lo� ISO settings. Some cameras have an extension beyond the highest analog gain that is accomplished by the further application of a digital gain. This sometimes, but not always, corresponds to the �Hi� ISO settings. Determination of the regions is performed separately. There are several techniques. I usually inspect optical black read noise data since it is unaffected by digital gain. Note that when ISO is raised then highlight is lost in direct proportion to the change in ISO. For example, increasing from ISO 200 to ISO 400 is always a loss of 1 EV in the highlight portion of PDR. However, as we raise ISO, in the analog gain region, shadow performance always improves (sometimes only slightly). This results from fixed noise in the sensor becoming less important as gain increases. When we raise ISO one stop via analog gain, the PDR will drop by some value less than one stop (sometimes only slightly less than one). This is why the PDR curves all ultimately have a slope of �1 on their right-hand-side. The amount of improvement in the shadow measurement when ISO is increased is what I am calling the PDR Shadow Improvement. For those shooting raw it can be useful to know when raising ISO in the camera has little or no advantage over applying digital gain in post processing. It�s common to use read noise in electrons versus ISO to guess at where raising ISO is no longer of �value�. This works because the underlying value of interest is proportional to read noise in electrons. But the relationship is not linear and the determination is subjective. 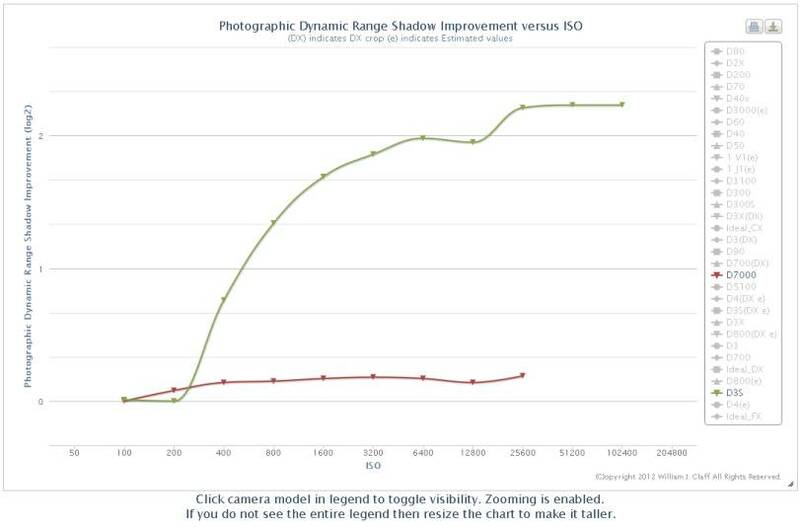 PDR curve data can be interpreted differently to produce an objective measure of shadow improvement versus ISO. This allows the photographer to decide how much shadow improvement they are willing to trade-off against raising ISO. It�s clear that for the D7000 going beyond ISO 400 has no advantage and that even at ISO 400 the shadow gain is minimal. The D3S shows strong shadow improvement through at least ISO 3200. Perhaps in the future we will be able to set raw and jpg ISO separately. For now understanding PDR Shadow Improvement is only of real interest to the raw shooter who post processes everything.